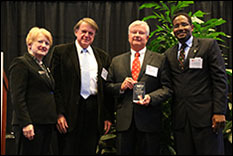 Pictured, from left to right: MIPS Director Martha Connolly; Dr. John Baras, Lockheed Martin Chair in Systems Engineering and Professor, Department of Electrical and Computer Engineering and Institute for Systems Research at the University of Maryland; John Kenyon, Senior Vice President for Engineering, Hughes Network Systems, and Clark School Dean Darryll Pines. Lockheed Martin Chair in Systems Engineering, Professor John Baras (ECE/ISR) was named “Principal Investigator with Greatest Impact”, one of the most significant awards bestowed during the Maryland Industrial Partnerships (MIPS) 25th Anniversary celebration. HughesNet®, the product which resulted from Dr. Baras’ collaboration with Hughes Network Systems, was also recognized as the Largest Selling Product at this anniversary gala. HughesNet® is the largest-selling product ever developed with the help of the MIPS program. Baras created the algorithms by which the Internet is delivered over satellite worldwide. Hughes sought to develop a service to provide Internet to consumers and businesses via satellite but needed to develop a communications protocol for delivering data via satellite. Former electrical engineering graduate student Aaron Falk worked with Baras and Hughes’ Doug Dillion to turn conventional wisdom on its head and develop asymmetric Internet protocols—that send data to the satellite at one speed, and down to a modem at another—for use over satellite. Prevailing theory at the time held that long latency would make this impossible. The protocols developed by Baras and Hughes are now called TIA-1008, a standard adopted intact by the European Telecommunications Standards Institute. Over 30 papers were published as a result of the MIPS work with Hughes, according to Baras. In 1997, Hughes launched DirecPC (now called HughesNet), the first consumer product/service to offer Internet access via satellite. As of December 31, 2011, HughesNet had approximately 626,000 customers. A recent COMSYS Report on the VSAT (very small aperture terminal) business credits Hughes with 49.8 percent market share in the global enterprise terminal market, double its nearest competitor. In the North American consumer market, the report shows Hughes with a 48.4 percent share, almost 12 percent more than its nearest competitor, and notes that its satellite Internet subscriber base is steadily expanding while that of competitors has stalled.